Writer Sarah Dollard returns with a sharp and powerful story which sees The Doctor & Bill visit the last Frost Fair of 1814. There they discover strange lights under the ice and a hungry creature lurking beneath. The plot isn't the main focus of this episode but more about The Doctor & Bill forming their friendship, giving Bill the opportunity to prove she how fantastic a companion she is. The story lays the foundations for Bill to realise the risks and dangers involved traveling with The Doctor. The atmosphere and setting are exceedingly splendid and utterly realistic of the period, providing an engrossing backdrop. Bill's amazement continues to be real and unique to her believability of the situation. Her and The Doctor's friendship have the most subtle, charming moments that they alone are all it takes to keep you firmly gripped. But the grittiness of social discrimination and racism stand firm throughout the episode. It allows Bill's heroic actions to filter out the diabolical social conventions of the time. Bill questioning The Doctor on how many people he's killed is a standout moment. The Doctor's honesty shows how much Bill has to learn about him. The legitimacy of the sea creature is a strong one as The Doctor never truly understands how it grew to be so large. But evolution would more likely play a huge part. The supporting cast added layers of comedy and energy that played off The Doctor & Bill's feud marvelously well. Bill's personal development throughout is powerful and highlights the choices The Doctor's companions have to make. It's tough and sometimes cruel, but The Doctor wouldn't have been able to save as many people as he has without making the toughest decisions. 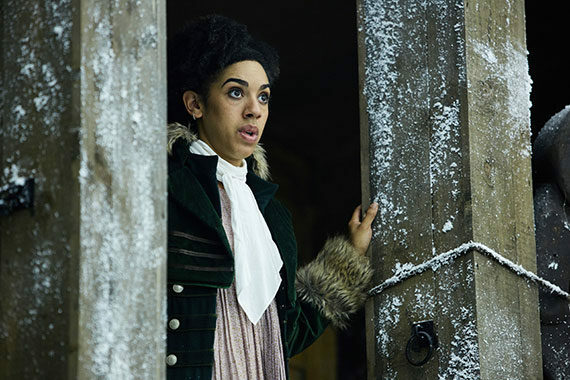 Nardole's scene with the knocking echoing within the vault was mysterious and intriguing. It certainly leaves you guessing about who or what is in there. Thin Ice is an emotional and charming adventure with a powerful script, excellent plotting and an exceptional production that together makes for another compelling episode.